Under the initiative which was started by General Directorate for Foundations and Istanbul Goverment Istanbul Project Coordination Unit following the protocol signed between Istanbul Governorship and General Directorate for Foundations on April 26, 2016, a workshop was organized on September 1, 2016 on the “Project for Preparing Earthquake Risks Management Guidelines for Historical Structures” with support of Ministry of Culture and Tourism and ICOMOS. 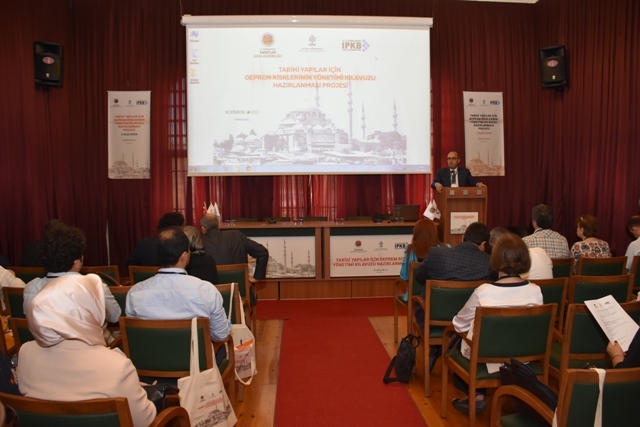 In the meeting which many academics and experts in their fields attended, IPCU Director Kazım Gökhan Elgin delivered the opening speech addressing to Istanbul’s seismic risk and their performances under ISMEP Project. Following speech of Salman Ünlügedik, Director of Istanbul Surveying and Monuments, General Directorate of Cultural Heritage and Museums, Ministry of Culture and Tourism, and of Ali Hürata, Deputy General Director of Foundations, the workshop started under presidency of Prof. Dr. Zekai Celep and IPCU Deputy Director Yalçın Kaya. Issues which were addressed to in the workshop which was organized to establish topics of guidelines’ contents included project’s purpose, scope, basic definitions and concepts required to be determined, and materials used in historical structures and materials damage, construction systems for historical structures, and possible damage conditions, structural modelling and evaluations, response methods, and earthquake-oriented disaster and emergency methods.